The Gili islands are the pride and joy of Lombok. They offer white-sand beaches, turquoise seas, birds in the sky, fish under the water, and romantic nights around the campfire. Today we’ll talk about Gili Rengit, one of the least known members of the Gili family. It’s located in South West Lombok, right between Anyaran, Layar, and Gede, three similar islands in the area. It’s safe to say that Rengit is one of the best spots for snorkeling. In fact, the entire south-eastern region of Lombok is made for swimming, diving, and snorkeling. The fans of surfing will be happy to find out that Desert Point, a world-famous spot and a paradise for surfers, is 30 minutes away. Rent a boat for a day or so and sail away! Nature in Gili Rengit is incredible and will set the right mood the second you arrive there. I know that white-sand beaches and mesmerizing sunsets won’t be news for the tourists that are used to traveling to tropical islands, but I’m just letting you know that they are there. Usually, we’ve got two types of visitors: the first group is all about checking out the most popular places so that they can take selfies there. The second group likes its privacy and would rather find solitude in a less-known island. The biggest advantage of the “Secret Gilis” is the fact that they are way cleaner and there aren’t many locals/tourists to mess up your mojo. What Is Gili Rengit All About? So, as I just said, this island has enough up its sleeve to keep you entertained for days. Play volleyball on the beach, walk around with your loved one when the sun goes down, or just lie under one of those umbrellas to catch your breath after an eventful night. In Gili Rengit, everything is right there in front of you, no need to walk for miles for it. The tourists are free to rent snorkeling equipment and check out the underwater life with or without an instructor. Trust me: there’s nothing hard about putting on a fancy suit and diving. The views in Rengit are mesmerizing, with those tall trees, the white sand, and the birds singing in the air. You might even find some cows and other cattle walking around like the island belongs to them. For some, everything that I just mentioned equals “boring”; for others, that’s exactly what they need after running around and taking care of their busy big-city lives. Gili Rengit is definitely not the party capital of Lombok, but it’s not even trying to be. It’s the true face of Indonesia if you will. People there are simple and work hard to provide for their families, just like we all do back home. Everything is cheap and the service is great, despite the fact that most of the locals don’t really speak English. It would be great to know some Sasak words to communicate with them – that’s for sure. As a general rule, the fans of privacy should pick a date during the low season so that they get most of the island to themselves. During the Indonesian holidays, it’s customary for the local kids to visit the Gilis as a part of their vacation tour. Keep that in mind. It’s not that you won’t be able to enjoy your stay there during the high season, though. On the other hand, Gili Rengit is pretty tiny, and there aren’t any cars/bikes allowed there – not even horse carts. If you take some time and move closer to the center of the island, you’ll see that there aren’t any palms there. It’s more of a classic forest, so to speak, with leaves lying on the ground. For camping out, starting a fire, and sharing some scary stories with the local kids, Gili Rengit is a top-3 spot in Lombok. The first thing you gotta understand about the so-called “Secret” Gilis is that they are a lot less developed when it comes to hotels and cafes/restaurants. The good news is – even though there aren’t any proper accommodation options in Rengit, you will find several offers in Asahan and Gede. It will take 10 minutes to get there from where you are at right now, and the prices are more than affordable, mostly because these parts of Lombok aren’t that popular, as I mentioned earlier. So, take advantage of that and make the most out of your trip! Not much, actually. But when you’re in Gili Rengit, feeling the sand under your feet, hearing the waves hit the shore, and listening to the birds up in the air, you don’t really need anything else to feel happy. Fact: compared to the state of the south-western islands 5-10 years ago, today they are well-developed and more “civilized” than ever. You can book a hotel room or even a reservation at a restaurant, choose between several companies that provide boat renting services, and hire a guide that will take you to the best places in the area. 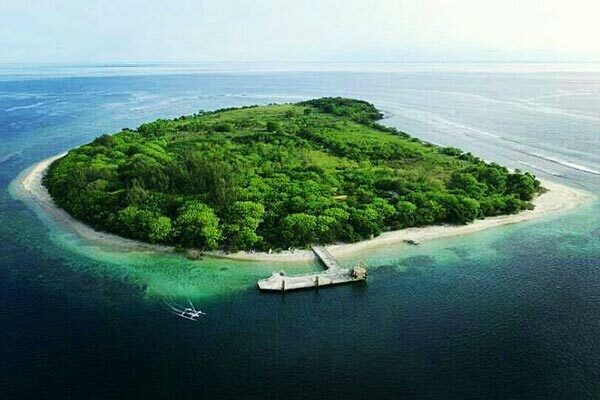 If you’re a big-time celebrity and just want to escape all the attention in the media, Gili Rengit will definitely be a perfect place to hide. Go ahead and take a good look at the pictures: aren’t they absolutely stunning? True, they were taken by professional photographers with a lot of editing, but this is one of those rare cases when what you see is what you get. According to the locals, Rengit is the least popular island in the area. That means there aren’t any public facilities, warungs, or even berugaks where you’re headed. On the other hand, its virgin state makes it possible for the corals, different kinds of fish, and exotic animals/birds to live there. Gili Rengit might not be the fanciest spot in Lombok, but for those looking to just take it all in without any hassle, it doesn’t get better than this. If you’re not planning on leaving the island for days and want to turn into a “caveman”, then it will be wise to take as much food and drinks with you as possible. You can get everything from Gede and Asahan, just like I said earlier. Some additional items might include a swimsuit, some dry clothes, a couple of towels (that is if you’re traveling with friends/loved ones), and, of course, a solid camera for taking some pics and videos. Oh, and don’t forget to grab as many batteries as possible for the trip to Gili Rengit. As you’ve probably already figured out, the locals don’t really like credit cards, and there aren’t any ATMs in this area. So, make sure to cash out at the airport; otherwise, you won’t be able to buy anything and/or pay for the food and the hotel room! Been there, done that – it’s no fun at all. The fans of sailing will be happy to learn that there are ferry rides available in the area, along with some cheap-yet-exciting boat tours that take in up to 6 people. What else? That’s it, basically. If you’re an island person and can’t imagine your holidays without sandy beaches and lounge chairs, Gili Rengit should be on your list of top-3 places to visit. How To Find Gili Rengit? The Tembowong harbor is where you’ll find a boat heading towards the Secret Gilis. The ride won’t take more than 30 minutes. The average price for 1 person is 10 dollars, but it keeps changing all the time. So, don’t take my word for it. From the one and only International Lombok Airport, the path to that harbor is approximately 70km long. If traffic isn’t bad, you’ll get there in less than two hours. From the biggest city in Lombok – Mataram – it will take you 1 hour and 30 minutes to reach the destination. In fact, there are many other ways to get to Gili Rengit. Public transportation is the least exciting option, as it’s slow, boring, and cramped up. A taxi is the most optimal pick but will be expensive, especially during the holiday season. Renting a car or a motorbike seems like the most reasonable choice. If you’re in Kuta, just rent a boat there and sail along the south-western coast. It will be a long ride, though. The tourists that landed in Bali first can also use speedboats of ferries. Bali is Lombok’s neighbor and is located further to the west. Don’t be afraid to ask people for help – that’s the key to success in Indonesia. Even though the language barrier is still strong, that doesn’t mean you won’t be able to get through to them. As always, I wish you a happy trip! If you're in the tropical island mood right now, this Gili will make all of your dreams come true! The fewer people know about this place, the better. I for one don't want it to become crowded. Gili Rengit was one of the first tiny islands in Lombok I ever visited. Still one of my favorites. Those boat tours are something! Never had so much fun sailing around and admiring the view. Gili Rengit might not qualify as "fancy", but it definitely is a wonderful place to visit.